Cat Dreams is my new music album on compact disc (cd). It is a work of love, dreams, heart, magic. Music from my life shared with some beautiful little creatures, loved ones. Being a part of their lives as they were and are a part of mine. Biographical dreams and stories. Life music: sweet, emotional, deep, beautiful, happy and sad. Cat Dreams starts and ends with the sound of rain, with cats by a window listening to the rain outside and napping together. Dreaming together an episodic flow of stories, songs, dances, memories, moments, travels, adventures. 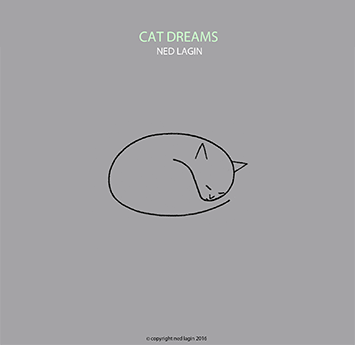 Musically Cat Dreams is a suite of composed pieces, and melodic, tonal, and rhythmic frameworks for improvisation. Moment forms and dream forms. Each it's own world of feeling and meaning. Cat Dreams was recorded over the past few years on a laptop computer, mostly in my living room, and some in rented practice rooms, but not in a professional studio. The spirit and energy of home and love, with the help and participation of great musicians playing beautifully, intuitively, personally. The Cat Dreams are all "first takes", like a live album, as played and heard by the musicians and the cats present: 17 songs, 77 min. 50 sec.